바이브, 린, 엠씨더맥스, 스윗소로우가 한 자리에 모였다. 국내 최고의 보컬리스트 바이브, 린, 엠씨더맥스, 스윗소로우가 함께 모여 즐겁게 촬영한 단체 사진 컷이 이들의 소속사 뮤직앤뉴의 페이스북 및 트위터를 통해 공개 됐다. 오는 10월 개최되는 소속사 뮤직앤뉴의 합동 소극장 콘서트 ‘It’s New Party’를 통해 한무대에 오를 예정인 바이브, 린, 엠씨더맥스, 스윗소로우는 최근 서울의 모 스튜디오에 모여 ‘뮤직앤뉴 패밀리’ 단체 사진을 촬영하며 의미있는 시간을 가진 것. 총 12회 공연으로 구성 될 이번 콘서트 ‘It’s New Party’는 바이브, 린, 엠씨더맥스,스윗소로우 ‘4팀4색’의 매력을 한 껏 느낄 수 있는 최고의 선물이 될 예정으로, 총 12회 공연 중 11회는 각 아티스트 별 단독 공연, 콘서트 마지막 날인 10월 16일에는 네 팀의 합동 공연으로 각각 진행된다. ‘It’s New Party’의 공연 티켓은 오는 30일 오후 8시, 인터파크를 통해 판매가 시작된다. Vibe, Lyn, M.C. THE MAX, and SWEET SORROW got together. The best vocalist in Korea Vive, Lyn, M.C. THE MAX, and SWEET SORROW took a group picture happily and it was open through their company Music n News facebook and twitter. They will perform through a joint concert of their company ’It’s New Party’ on October, so they have a meaningful time to take group pictures of ’Music n New Family’ at a studio in Seoul lately. 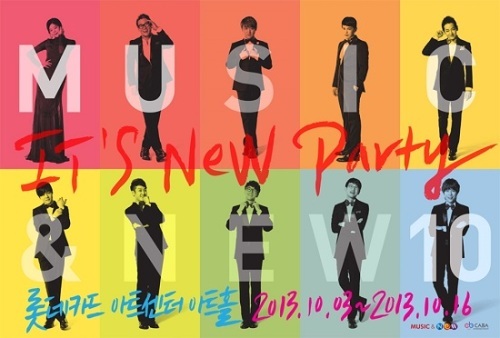 This concert ’It’s New Party’ is consists of 12th performances. It is said to be the best gift to give in order to feel the attraction of 4 teams, 4 colors of them. The 11th performances of 12th concerts are a solo performance of each artist and the last concert is a joint concert of 4 teams on October 16. Tickets of the concert ’It’s New Party’ will be started to sell through Interpark at 8 PM on 30th.